Offering you a complete choice of products which include cut stone necklace and designer ruby necklace. We are one of the leading manufacturers of Cut Stone Necklace that are fabricated using the finest quality bones, wood, glasses and metal parts. 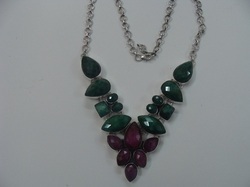 Cut Stone Necklaces are exquisitely designed as per latest fashion trends. 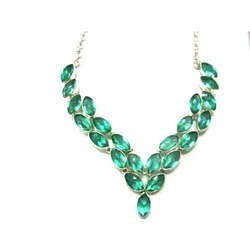 Moreover, Cut Stone Necklaces are attractive and add to the appearance of the wearer. Our feasible price range makes Cut Stone Necklaces at very appropriate prices. We are one of the leading manufacturers and exporters of Designer Ruby Necklace. Have years of experience our professionals design and work on these necklaces minutely, thus making it very comfortable to wear.